Not much progress again this week :-( I was babysitting for a friend on Tuesday and used the evening to finish the graphic design (and add some further improvements) of the next version of Zombology, but then was too busy for the rest of the week to either print them out or playtest them. I was hoping to get the printing done on Friday night while The Wife was at the cinema, but after a bad night's sleep The Wife cancelled, and my cousin popped in on a visit from Bath while showing her son local universities he's considering attending. I was also hoping to make it to Newcastle Gamers for the first time in months on Saturday, but instead we went on an impromptu camping trip to the wilds of the North Pennines (which were lovely!). I missed the last Newcastle Playtest too due to a work trip, and I'm going to have to miss the next one for the same reason - I'm travelling a bit more for work now. Newcastle Playtest is only monthly, so I'm going to go three months without attending one, which is pretty pants for a supposed co-organiser. All this has got me thinking. Am I really set up for another self-publishing company? I did pretty well last time around, but I had no kids at that point and The Wife was really busy with work so I had plenty of time in the evenings for making games and marketing. A weekend away at a convention was an easy sell at home because The Wife was busy and often worked some or all of the weekend anyway. Now I'm travelling more with work and have a family, do I really want to be going away from them on the weekends that I'm not away for work to demo and sell games at conventions? Last time round I sold a good chunk of games at conventions. I went to The Cast Are Dice, Beer and Pretzels, The UK Games Expo and a few smaller ones. It was a good opportunity to promote my games because when you're running a small company with no marketing budget the vast majority of your intended audience have not heard of you, your company or your products. When I'm going on regular trips away for work, some of which eat up a weekend it's much harder to justify giving up another weekend away from The Wife and The Daughter for selling games. The Daughter's growing up so quickly at the moment that every missed moment counts. The work trips are also getting in the way of playtesting, my Games Nights and attending Newcastle Gamers. In addition to time for developing, manufacturing and selling the games, I also need time to test them, and at the moment it feels like I haven't got that time available. I've got 13 pre-orders already, which is good, but that's less than 10% of the print run I'm planning. Can I sell the other 90-odd percent through free web marketing and the odd convention attendance? I don't know. Anyway, I'm going to take a couple of weeks before I commit any money to the effort to check whether I'm sure I'll have the time to commit to making this successful, or whether I think I can make this successful with the time available to me. I'll also consider other paths to publishing one final time: print on demand, or selling to another publisher. Moving forwards, only very slowly. The good news is that my company bank account is set up and ready to use, the bad news is that I don't yet have online access to it, and I want to make sure it's all up and running correctly and there's cash in it before I start spending from it. In other progress this week, I've tweaked some art for Zombology, done a first draft of a company logo (now with my dad, a graphic designer and artist, for review) and I've selected a web hosting company for the company website. But still, slower going than I was hoping for. I need to get the holding web page ready to put up on the website once it's ordered and print out the new version with its rules tweaks this week too. Once it is physically realised, I can start testing this new version to check I've not broken anything with these minor rules changes. I must do these things this week. Must. It's almost halfway through the year and I'm still a way off publishing the game. As I mentioned last week, one of the things I had to do this week was an appointment at the bank to open a bank account for my new hobby board games publishing company. This is an important step in my journey to being a publisher again: before I can sell games I need to get them manufactured and I need a website and a PayPal account, all of which require a bank account to fund. The business adviser that I spoke to in the bank was impressed that I'd taken along all the games I'd (self-) published as Reiver Games. I wanted to give him an idea what I was talking about, but also to show him that this wasn't a crackpot idea, it was something I had some experience and knowledge about. As it was it was unnecessary, he'd played Settlers of Catan with some friends a few weeks ago, so he knew exactly what I was talking about. Disappointingly, unlike when I created the Reiver Games account back in 2006, he didn't place an order! The account was ordered on Thursday, there's some legal things they have to sort out, so it should be set up properly on Tuesday, then it's game on. In the meantime, I've some tweaks to try out from my playtesting in the States and I'd like to give a few key playtesters access to the latest version to get their feedback while I start improving the art. I had great ideas initially about trying to do some comic style art myself, but I think it's more realistic to do some simple iconic art (more like 6 Nimmt!) rather than wait until I've improved my art skills to the point where they are good enough. We've got a very busy week at work this week, so I doubt I'll be able to test it one lunchtime, but maybe it can get some action at Games Night on Wednesday. Anyway, there's plenty to be getting on with now! 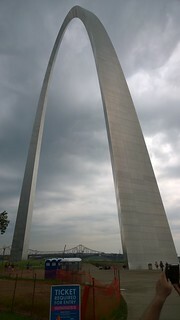 As I mentioned last week, I've spent the most of the last week in St. Louis, MO at a conference for work. It was a long and busy week, but I managed to get a night off on Wednesday and that meant I could get over to the St. Louis Board Gamers Meetup at The Wizard's Wagon in University City. I've been to this conference four times in a row now. The first time in Vancouver I met up with Tao who runs Starlit Citadel (who had been a supporter of me in my Reiver Games days). The second time in Minneapolis I got to go to the Fantasy Flight Event Center twice on two consecutive nights with gamers who collected me from my hotel, drove me to a restaurant for dinner, then to the Center for gaming and then finally back to my hotel (thanks Alfredo, Jay and Fred!). Last year in Baltimore I got nothing, but this year I struck gold again. Dan posted on the Meetup page that he could meet me at a coffee shop opposite a Metro station and then drive me over to The Wizard's Wagon. Which he did after first recommending a take out place and something good from the menu. We played seven games (variously with Dan, Patrick, Rebecca, Chris, Jim and Kit) including a couple of playtests of six-player Zombology (from which I got some new ideas to try out). At the end of the night Kit also introduced me to Medina by Stefan Dorra which I thoroughly enjoyed. 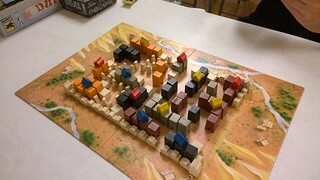 It was a great game, coupled with very attractive city construction during play. There's apparently a re-print coming fairly soon. Finally Dan drove me back to my hotel in time to meet up with my colleagues for a final couple of drinks on our last night in St. Louis. Thanks Dan for a great evening! That's now three times I've agreed to meet a random American whom I've only met on the internet, get in his car and get driven to an out of town location, and not once have I been axe-murdered. Board gamers are awesome! I'm back now, and The Wife is away for a couple of days with work tonight and tomorrow. I'll be using my free evenings to make a new version of Zombology to try out some of the ideas generated in America, and to prepare for Thursday morning's meeting with the Bank Manager. We're almost off to the races! I'm writing this at 3:30am in my hotel room listening to Mongolian Folk Metal, clearly not yet on US time :-( And St. Louis isn't very sunny either. The last week has been a bit of a blur. I drove to Bristol, then Devon, then went to Plymouth for a few hours to see Dave, one of my old friends from York who had the temerity to move four hundred miles away. It was great to catch up again, Dave had been around during the founding of Reiver Games and even came to the UK Games Expo with me back in 2007 to help out on my stand. But since he moved down south we've seen very little of him, 400 miles is a long way to travel with a two year old! After that we had a few days in a rented farm 'cottage' with eleven other members of my family - 14 of us in total! It was a lovely week, and we even played a few games - gaming is not something I generally do with my family (usually the in-laws), by my sister, brothers-in-law and even my mum got involved. We played five back to back games of Zombology one night and I've taken a few more orders off the back of that! The day after driving back from Devon I was collected at 6:30am for my trip to St. Louis, MO. I'm out here for a week for work, but I spent a chunk of the flight time playing board games on my iPad with my boss Ian and I'm hoping to make it along to the St. Louis Board Gamers MeetUp on Wednesday evening at a Wizard's Wagon. We'll see!